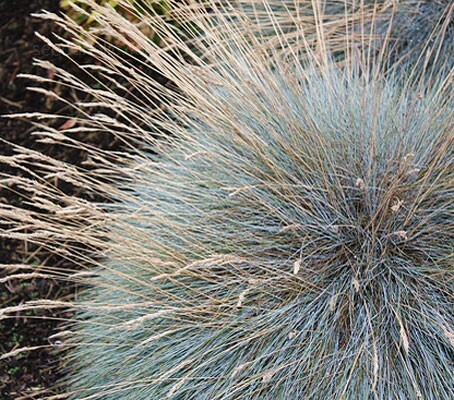 Dainty diminutive Festuca glauca makes a tight mound of steely blue, needle-like blades and is one of the most tactile of the evergreen grasses. A new flush of blue-grey leaves appears by early spring and makes a fine foil for bright, low-growing bulbs. Planted as a specimen or in swathes across a high- summer garden, the colour is so unexpected it can't help but catch the eye. Festuca glauca is not a showy specimen plant but in a minimalist scheme, against a backing of slate and red chippings, it adds texture, colour and interest. 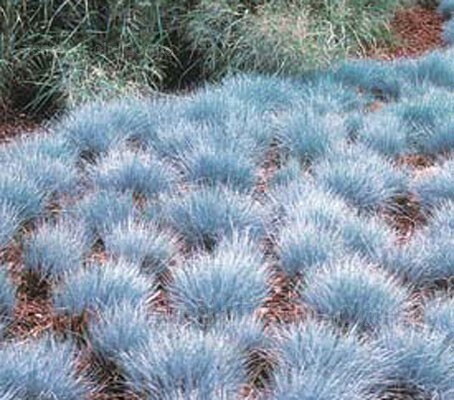 These fescues look terrific planted in a silver-blue swathe among taller grasses: weave them through dark carexes or plant them around the base of deschampsia, molinia or miscanthus. Good companions - Small, sun-loving plants such as rock roses, thymes, smaller erodiums and single, low-growing pinks, mingle well with this grass on a scree or slope. Alternatively, dark-leaved sedums and the strappy-leaved black Ophiopogon planiscapus 'Nigrescens' provide a strong contrast to the clumps. Dark-purple lavenders of every type, the large-leaved sage (Salvia officinalis), lamb's ears (Stachys byzantina) and the ponytail grass (Stipa tenuissima) make good companions in a sunny border of silvers. For a striking spring partnership, team blue fescue with Crocus chrysantha 'Blue Pearl' and 'Ladykiller', pink and red species tulips or deep-blue scillas. Once seedlings are large enough to handle, take a small clump of seedlings and put them all in a one-litre pot of gritty compost. They will form a bushy plant and be ready to go into the garden in summer. Grow in sun and in well drained soil. Sow 6mm (¼in) deep in rows 30cm (12in) apart in well cultivated soil which has been raked to a fine tilth. Germination is occasionally slow, so be patient! Feed in spring like ordinary perennials, with a single dressing of a general fertiliser. Even without an annual feed, most grasses will put on a first-rate show. The more nitrogen grasses receive the greener and further they'll grow. This spreading habit is fine in a field, but in a garden they may become too lush and the flower quality may suffer. Once the plant is established, divide in March to April. It is relatively easy to propagate by division. 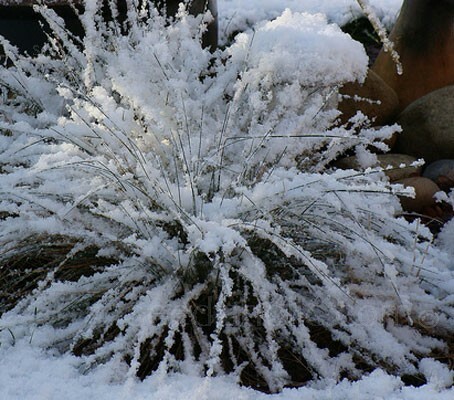 Do this in spring, not autumn, as some newly divided plants may rot before they've developed a good root system. Architectural, Cottage/Informal Garden, Drought Resistant, Flower Arranging, Flowers Borders and Beds, Green Roof, Low Maintenance, Mediterranean or Maritime. Native to Europe, it was originally described by French naturalist Dominique Villars. 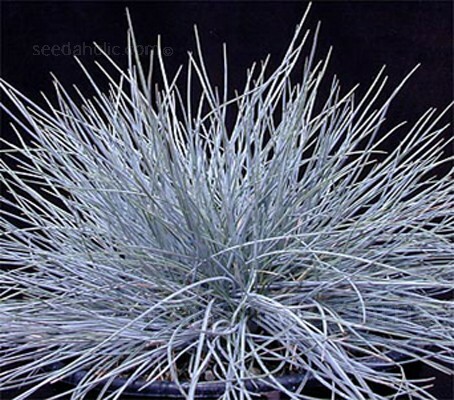 Festuca is derived from the Latin festuca meaning ’stalk or straw’. The species name glauca is derived from the Greek word glaucous meaning ‘blue grey’ in reference to the colour of the leaves. 14 days at around 20ºC (68ºF).